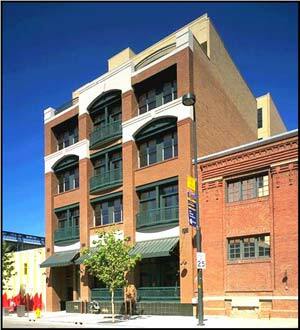 2245 Blake Street is located in Denver's Ballpark neighborhood, just north of Coors Field, home to the Colorado Rockies. The loft project was constructed with early 20th century architectural features, yet as a new building offers luxury, convenience, security and privacy to provide a downtown residence with the comfort of a custom home. A 6-story building with just 14 custom lofts, the loft residences have spectacular mountain and downtown Denver skyline views and access to a common rooftop patio with hot tub. 2245 Blake Street offers new solid steel & brick construction with professionally designed kitchens of the highest quality with slab granite and custom cabinetry.